Hierapolis is located 12 mi. [km.] north of the modern city of Denizli and 6 mi. [9.5 km.] north of ancient Laodicea. It is on the northern edge of the Lycus Valley. 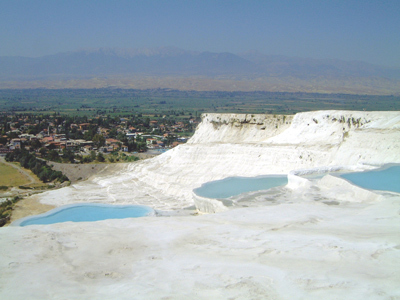 In modern Turkish it is called Pamukkale — “Cotton Castle” — due to the prominent white travertine cliffs that are fed by the warm thermal springs in the area. It was probably founded in the early second century B.C. by Eumenes II (ca. 197–159 B.C.) the king of Pergamum. Its history is somewhat similar to that of nearby Laodicea but it seems to have functioned more as a spa and religious center whereas Laodicea seems to have been the commercial center in the area. Hierapolis was famous for the wool and cloth that were produced there — especially its purple dye that was made from plants that grew in the area and that was enhanced by the mineral content of the thermal springs. It is probable that Paul’s companion Epaphras founded and ministered to not only the churches at Colossae and Laodicea but also to that at Hierapolis (Colossians 4:13). There is no record that Paul ever visited the city though he probably passed through the area of the Lycus Valley on his second and third missionary journeys.